A Trunki children's suitcase is more than just somewhere to pack the kid's travel essentials. It looks great so the kid's love it from the start and will enjoy pulling it along them. And when they get tired they can jump on and have a ride! The Trunki suitcase is lightweight and durable and that's what you need when traveling with children. Plus the fun characters and colors will bring admiring comments from other travelers. All Trunki suitcases are made from strong, hard plastic. It is seriously tough as we've dropped it down a set of stairs (not on purpose) and there are no marks. As the case can hold over 50kg (100lbs) you could possibly get two children riding on one case. It's hand luggage approved, so no need to check in at the airport. Light enough for young children to pull along themselves, it is also perfectly stable as a ride-on toy as the four wheels are even and robust. Age range: 3-6 years approx. 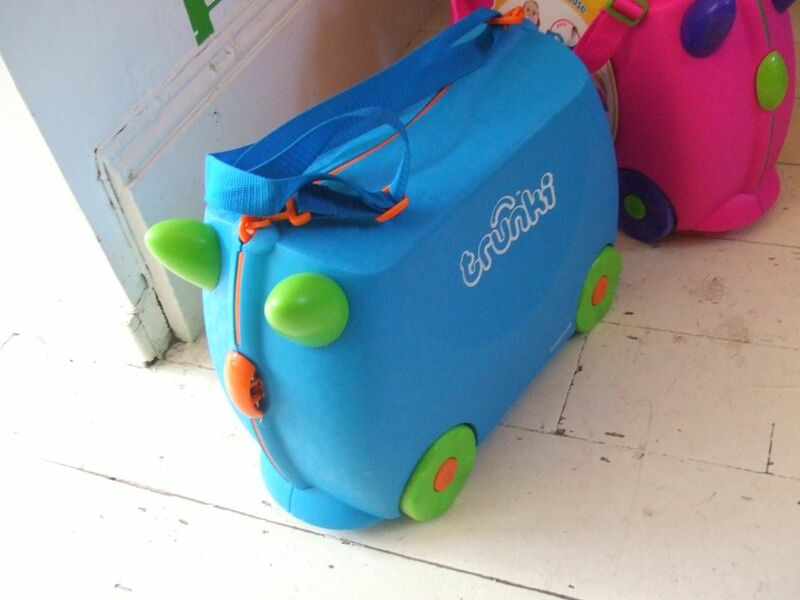 Trunki suitcases are well-made, so you should have it for many years. Don't be too concerned about the age range: Your child will find plenty of uses for their case. Colors: There are lots of colors and characters in the range, and more specials arrive each year, so every child should be able to find the right one for them. There are two clasps that can be 'locked' with the simple key attached to the strap handle. You will probably need to help your child to open the case but that's a good thing as you don't want them emptying the contents around the airport. There's an elastic 'teddy bear seat belt' to hold everything in place on one side. The soft rubber seal ensures everything stays in plus no nipped fingers when closing. Once closed, the case has hard 'horns' for children to hold on to when they ride and there's a molded saddle shape so the rider doesn't slide about. Even young children can move themselves along quite easily. There's a detachable strap with a loop handle for either clipping on at one end for pulling the case, or clipping on at both ends and to carry on your shoulder. We've never had the strap unclip itself either when being pulled along or carried. There are also short handles so you can grab the case quickly when needed. There's an ID label on the strap handle which is worth filling in as you see plenty of these cases at airports these days so you don't want any confusion if kids start playing together. Rob Law had the idea for the ride-on suitcase back in 1996 and took it to the BBC TV show, Dragon's Den, where entrepreneurs try to convince business experts that they have a good idea. Surprisingly, Trunki was turned down for financial backing but we can all be grateful Rob realized he had a good product. He has been back on the show and the Trunki suitcase is now widely recognized as 'the one that got away'. Kids like having some control over their lives and holiday time can be tough as their routines are lost and they can seem more difficult but often just want to have some responsibility for their life too. The small pull-along cases seem like a good idea when your child is at home but you know the kids will get bored and you'll be left carrying it at some point – and those handles are not long enough for an adult, are they? The clever Trunki designers realized children are happier when they can play with a friend, and a Trunki case is a character, so is a great companion for your little one while away from home. It's a ride-on toy to play on while you're in queues or waiting at airports or stations. And when they get tired – and they will (especially when just off the plane) – you can pull your child along while they are seated which means you know where they are and they haven't left their case anywhere. It also makes it fun for the child, so complaining levels should be reduced.